If I am not wrong, Lynn has indeed confirmed that she has been seeing Diamond Platnumz on the side. Just a few days Lynn went on to share a selfie from Diamond Platnumz bedroom just to prove the singer was still in her life. With the news making rounds on most tabloids, Tanasha Donna decided to address the issue through her Instagram page. According to her post, Tanasha warned fans from believing everything being said on social media. 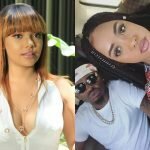 Fans pitty Tanasha Seeing how Diamond Platnumz treated Zari when they were in a relationship; many believe that the Tanzanian singer is finally bored with his Kenyan girlfriend and now wants drama. Most fans went on to warn the young NRG radio presenter telling her to leave him before he continues to embarrass her. Four wives Anyway in a new phone call interview, Lynn goes on to shade Tanasha saying Diamond Platnumz is allowed to have 4 wives; after being asked whether the bed she was sleeping on belonged to Baba Tee. The post “Mwisho wake wanawake wanne kwani hajui!” Diamond Platnumz lovers continues to shade Tanasha Donna appeared first on Ghafla! Kenya.